an integrated farming system that strives for sustainability, the enhancement of soil fertility and biological diversity whilst, with rare exceptions, prohibiting synthetic pesticides, antibiotics, synthetic fertilizers, genetically modified organisms, and growth hormones. Since 1990 the market for organic food and other products has grown rapidly, reaching $63 billion worldwide in 2012.:25 This demand has driven a similar increase in organically managed farmland that grew from 2001 to 2011 at a compounding rate of 8.9% per annum. As of 2019, approximately 70,000,000 hectares (170,000,000 acres) worldwide were farmed organically, representing approximately 1.4 percent of total world farmland. Agriculture was practiced for thousands of years without the use of artificial chemicals. Artificial fertilizers were first created during the mid-19th century. These early fertilizers were cheap, powerful, and easy to transport in bulk. Similar advances occurred in chemical pesticides in the 1940s, leading to the decade being referred to as the 'pesticide era'. These new agricultural techniques, while beneficial in the short term, had serious longer term side effects such as soil compaction, erosion, and declines in overall soil fertility, along with health concerns about toxic chemicals entering the food supply. :10 In the late 1800s and early 1900s, soil biology scientists began to seek ways to remedy these side effects while still maintaining higher production. Biodynamic agriculture was the first modern system of agriculture to focus exclusively on organic methods. : Its development began in 1924 with a series of eight lectures on agriculture given by Rudolf Steiner. These lectures, the first known presentation of what later came to be known as organic agriculture, were held in response to a request by farmers who noticed degraded soil conditions and a deterioration in the health and quality of crops and livestock resulting from the use of chemical fertilizers. The one hundred eleven attendees, less than half of whom were farmers, came from six countries, primarily Germany and Poland. The lectures were published in November 1924; the first English translation appeared in 1928 as The Agriculture Course. In 1921, Albert Howard and his wife Gabrielle Howard, accomplished botanists, founded an Institute of Plant Industry to improve traditional farming methods in India. Among other things, they brought improved implements and improved animal husbandry methods from their scientific training; then by incorporating aspects of the local traditional methods, developed protocols for the rotation of crops, erosion prevention techniques, and the systematic use of composts and manures. Stimulated by these experiences of traditional farming, when Albert Howard returned to Britain in the early 1930s he began to promulgate a system of natural agriculture. In July 1939, Ehrenfried Pfeiffer, the author of the standard work on biodynamic agriculture (Bio-Dynamic Farming and Gardening), came to the UK at the invitation of Walter James, 4th Baron Northbourne as a presenter at the Betteshanger Summer School and Conference on Biodynamic Farming at Northbourne's farm in Kent. One of the chief purposes of the conference was to bring together the proponents of various approaches to organic agriculture in order that they might cooperate within a larger movement. Howard attended the conference, where he met Pfeiffer. In the following year, Northbourne published his manifesto of organic farming, Look to the Land, in which he coined the term "organic farming." The Betteshanger conference has been described as the 'missing link' between biodynamic agriculture and other forms of organic farming. In 1940 Howard published his An Agricultural Testament. In this book he adopted Northbourne's terminology of "organic farming." Howard's work spread widely, and he became known as the "father of organic farming" for his work in applying scientific knowledge and principles to various traditional and natural methods. :45 In the United States J.I. Rodale, who was keenly interested both in Howard's ideas and in biodynamics, founded in the 1940s both a working organic farm for trials and experimentation, The Rodale Institute, and the Rodale Press to teach and advocate organic methods to the wider public. These became important influences on the spread of organic agriculture. Further work was done by Lady Eve Balfour (the Haughley Experiment) in the United Kingdom, and many others across the world. Increasing environmental awareness in the general population in modern times has transformed the originally supply-driven organic movement to a demand-driven one. Premium prices and some government subsidies attracted farmers. In the developing world, many producers farm according to traditional methods that are comparable to organic farming, but not certified, and that may not include the latest scientific advancements in organic agriculture. In other cases, farmers in the developing world have converted to modern organic methods for economic reasons. —  Wendell Berry, "The Gift of Good Land"
The use of "organic" popularized by Howard and Rodale, on the other hand, refers more narrowly to the use of organic matter derived from plant compost and animal manures to improve the humus content of soils, grounded in the work of early soil scientists who developed what was then called "humus farming." Since the early 1940s the two camps have tended to merge. Organic farming methods combine scientific knowledge of ecology and some modern technology with traditional farming practices based on naturally occurring biological processes. Organic farming methods are studied in the field of agroecology. While conventional agriculture uses synthetic pesticides and water-soluble synthetically purified fertilizers, organic farmers are restricted by regulations to using natural pesticides and fertilizers. An example of a natural pesticide is pyrethrin, which is found naturally in the Chrysanthemum flower. The principal methods of organic farming include crop rotation, green manures and compost, biological pest control, and mechanical cultivation. These measures use the natural environment to enhance agricultural productivity: legumes are planted to fix nitrogen into the soil, natural insect predators are encouraged, crops are rotated to confuse pests and renew soil, and natural materials such as potassium bicarbonate and mulches are used to control disease and weeds. Genetically modified seeds and animals are excluded. While organic is fundamentally different from conventional because of the use of carbon based fertilizers compared with highly soluble synthetic based fertilizers and biological pest control instead of synthetic pesticides, organic farming and large-scale conventional farming are not entirely mutually exclusive. Many of the methods developed for organic agriculture have been borrowed by more conventional agriculture. For example, Integrated Pest Management is a multifaceted strategy that uses various organic methods of pest control whenever possible, but in conventional farming could include synthetic pesticides only as a last resort. Organic farming encourages Crop diversity. The science of agroecology has revealed the benefits of polyculture (multiple crops in the same space), which is often employed in organic farming. Planting a variety of vegetable crops supports a wider range of beneficial insects, soil microorganisms, and other factors that add up to overall farm health. Crop diversity helps environments thrive and protects species from going extinct. Placard advocating organic food rather than global warming. Organic farming relies heavily on the natural breakdown of organic matter, using techniques like green manure and composting, to replace nutrients taken from the soil by previous crops. This biological process, driven by microorganisms such as mycorrhiza, allows the natural production of nutrients in the soil throughout the growing season, and has been referred to as feeding the soil to feed the plant. Organic farming uses a variety of methods to improve soil fertility, including crop rotation, cover cropping, reduced tillage, and application of compost. By reducing tillage, soil is not inverted and exposed to air; less carbon is lost to the atmosphere resulting in more soil organic carbon. This has an added benefit of carbon sequestration, which can reduce green house gases and help reverse climate change. Mixed farms with both livestock and crops can operate as ley farms, whereby the land gathers fertility through growing nitrogen-fixing forage grasses such as white clover or alfalfa and grows cash crops or cereals when fertility is established. Farms without livestock ("stockless") may find it more difficult to maintain soil fertility, and may rely more on external inputs such as imported manure as well as grain legumes and green manures, although grain legumes may fix limited nitrogen because they are harvested. Horticultural farms that grow fruits and vegetables in protected conditions often rely even more on external inputs. Biological research into soil and soil organisms has proven beneficial to organic farming. Varieties of bacteria and fungi break down chemicals, plant matter and animal waste into productive soil nutrients. In turn, they produce benefits of healthier yields and more productive soil for future crops. Fields with less or no manure display significantly lower yields, due to decreased soil microbe community. Increased manure improves biological activity, providing a healthier, more arable soil system and higher yields. Organic weed management promotes weed suppression, rather than weed elimination, by enhancing crop competition and phytotoxic effects on weeds. Organic farmers integrate cultural, biological, mechanical, physical and chemical tactics to manage weeds without synthetic herbicides. Organic standards require rotation of annual crops, meaning that a single crop cannot be grown in the same location without a different, intervening crop. Organic crop rotations frequently include weed-suppressive cover crops and crops with dissimilar life cycles to discourage weeds associated with a particular crop. Research is ongoing to develop organic methods to promote the growth of natural microorganisms that suppress the growth or germination of common weeds. Other cultural practices used to enhance crop competitiveness and reduce weed pressure include selection of competitive crop varieties, high-density planting, tight row spacing, and late planting into warm soil to encourage rapid crop germination. Some naturally sourced chemicals are allowed for herbicidal use. These include certain formulations of acetic acid (concentrated vinegar), corn gluten meal, and essential oils. A few selective bioherbicides based on fungal pathogens have also been developed. At this time, however, organic herbicides and bioherbicides play a minor role in the organic weed control toolbox. Weeds can be controlled by grazing. For example, geese have been used successfully to weed a range of organic crops including cotton, strawberries, tobacco, and corn, reviving the practice of keeping cotton patch geese, common in the southern U.S. before the 1950s. Similarly, some rice farmers introduce ducks and fish to wet paddy fields to eat both weeds and insects. using physical barriers, such as row covers. Naturally derived insecticides allowed for use on organic farms use include Bacillus thuringiensis (a bacterial toxin), pyrethrum (a chrysanthemum extract), spinosad (a bacterial metabolite), neem (a tree extract) and rotenone (a legume root extract). Fewer than 10% of organic farmers use these pesticides regularly; one survey found that only 5.3% of vegetable growers in California use rotenone while 1.7% use pyrethrum. :26 These pesticides are not always more safe or environmentally friendly than synthetic pesticides and can cause harm. :92 The main criterion for organic pesticides is that they are naturally derived, and some naturally derived substances have been controversial. Controversial natural pesticides include rotenone, copper, nicotine sulfate, and pyrethrums Rotenone and pyrethrum are particularly controversial because they work by attacking the nervous system, like most conventional insecticides. Rotenone is extremely toxic to fish and can induce symptoms resembling Parkinson's disease in mammals. Although pyrethrum (natural pyrethrins) is more effective against insects when used with piperonyl butoxide (which retards degradation of the pyrethrins), organic standards generally do not permit use of the latter substance. Naturally derived fungicides allowed for use on organic farms include the bacteria Bacillus subtilis and Bacillus pumilus; and the fungus Trichoderma harzianum. These are mainly effective for diseases affecting roots. Compost tea contains a mix of beneficial microbes, which may attack or out-compete certain plant pathogens, but variability among formulations and preparation methods may contribute to inconsistent results or even dangerous growth of toxic microbes in compost teas. Some naturally derived pesticides are not allowed for use on organic farms. These include nicotine sulfate, arsenic, and strychnine. Synthetic pesticides allowed for use on organic farms include insecticidal soaps and horticultural oils for insect management; and Bordeaux mixture, copper hydroxide and sodium bicarbonate for managing fungi. Copper sulfate and Bordeaux mixture (copper sulfate plus lime), approved for organic use in various jurisdictions, can be more environmentally problematic than some synthetic fungicides dissallowed in organic farming Similar concerns apply to copper hydroxide. Repeated application of copper sulfate or copper hydroxide as a fungicide may eventually result in copper accumulation to toxic levels in soil, and admonitions to avoid excessive accumulations of copper in soil appear in various organic standards and elsewhere. Environmental concerns for several kinds of biota arise at average rates of use of such substances for some crops. In the European Union, where replacement of copper-based fungicides in organic agriculture is a policy priority, research is seeking alternatives for organic production. Raising livestock and poultry, for meat, dairy and eggs, is another traditional farming activity that complements growing. Organic farms attempt to provide animals with natural living conditions and feed. Organic certification verifies that livestock are raised according to the USDA organic regulations throughout their lives. These regulations include the requirement that all animal feed must be certified organic. 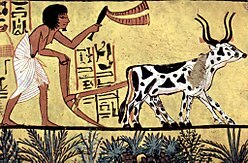 Also, horses and cattle were once a basic farm feature that provided labor, for hauling and plowing, fertility, through recycling of manure, and fuel, in the form of food for farmers and other animals. While today, small growing operations often do not include livestock, domesticated animals are a desirable part of the organic farming equation, especially for true sustainability, the ability of a farm to function as a self-renewing unit. A key characteristic of organic farming is the rejection of genetically engineered plants and animals. On 19 October 1998, participants at IFOAM's 12th Scientific Conference issued the Mar del Plata Declaration, where more than 600 delegates from over 60 countries voted unanimously to exclude the use of genetically modified organisms in food production and agriculture. Although opposition to the use of any transgenic technologies in organic farming is strong, agricultural researchers Luis Herrera-Estrella and Ariel Alvarez-Morales continue to advocate integration of transgenic technologies into organic farming as the optimal means to sustainable agriculture, particularly in the developing world. Organic farmer Raoul Adamchak and geneticist Pamela Ronald write that many agricultural applications of biotechnology are consistent with organic principles and have significantly advanced sustainable agriculture. Although GMOs are excluded from organic farming, there is concern that the pollen from genetically modified crops is increasingly penetrating organic and heirloom seed stocks, making it difficult, if not impossible, to keep these genomes from entering the organic food supply. Differing regulations among countries limits the availability of GMOs to certain countries, as described in the article on regulation of the release of genetic modified organisms. Organic farmers use a number of traditional farm tools to do farming. Due to the goals of sustainability in organic farming, organic farmers try to minimize their reliance on fossil fuels. In the developing world on small organic farms tools are normally constrained to hand tools and diesel powered water pumps. Standards regulate production methods and in some cases final output for organic agriculture. Standards may be voluntary or legislated. As early as the 1970s private associations certified organic producers. In the 1980s, governments began to produce organic production guidelines. In the 1990s, a trend toward legislated standards began, most notably with the 1991 EU-Eco-regulation developed for European Union, which set standards for 12 countries, and a 1993 UK program. The EU's program was followed by a Japanese program in 2001, and in 2002 the U.S. created the National Organic Program (NOP). As of 2007 over 60 countries regulate organic farming (IFOAM 2007:11). In 2005 IFOAM created the Principles of Organic Agriculture, an international guideline for certification criteria. Typically the agencies accredit certification groups rather than individual farms. Organic production materials used in and foods are tested independently by the Organic Materials Review Institute. Using manure as a fertilizer risks contaminating food with animal gut bacteria, including pathogenic strains of E. coli that have caused fatal poisoning from eating organic food. To combat this risk, USDA organic standards require that manure must be sterilized through high temperature thermophilic composting. If raw animal manure is used, 120 days must pass before the crop is harvested if the final product comes into direct contact with the soil. For products that don't directly contact soil, 90 days must pass prior to harvest. The economics of organic farming, a subfield of agricultural economics, encompasses the entire process and effects of organic farming in terms of human society, including social costs, opportunity costs, unintended consequences, information asymmetries, and economies of scale. Although the scope of economics is broad, agricultural economics tends to focus on maximizing yields and efficiency at the farm level. Economics takes an anthropocentric approach to the value of the natural world: biodiversity, for example, is considered beneficial only to the extent that it is valued by people and increases profits. Some entities such as the European Union subsidize organic farming, in large part because these countries want to account for the externalities of reduced water use, reduced water contamination, reduced soil erosion, reduced carbon emissions, increased biodiversity, and assorted other benefits that result from organic farming. Traditional organic farming is labor and knowledge-intensive whereas conventional farming is capital-intensive, requiring more energy and manufactured inputs. Organic farmers in California have cited marketing as their greatest obstacle. A density-equalising map of organic agriculture in Australia based on certified organic hectares. Australia accounts for more than half of the world's certified organic hectares. The markets for organic products are strongest in North America and Europe, which as of 2001 are estimated to have $6 and $8 billion respectively of the $20 billion global market. :6 As of 2007 Australasia has 39% of the total organic farmland, including Australia's 1,180,000 hectares (2,900,000 acres) but 97 percent of this land is sprawling rangeland (2007:35). US sales are 20x as much. :7 Europe farms 23 percent of global organic farmland (6,900,000 ha (17,000,000 acres)), followed by Latin America with 19 percent (5.8 million hectares - 14.3 million acres). Asia has 9.5 percent while North America has 7.2 percent. Africa has 3 percent. Besides Australia, the countries with the most organic farmland are Argentina (3.1 million hectares - 7.7 million acres), China (2.3 million hectares - 5.7 million acres), and the United States (1.6 million hectares - 4 million acres). Much of Argentina's organic farmland is pasture, like that of Australia (2007:42). Spain, Germany, Brazil (the world's largest agricultural exporter), Uruguay, and the England follow the United States in the amount of organic land (2007:26). In the European Union (EU25) 3.9% of the total utilized agricultural area was used for organic production in 2005. The countries with the highest proportion of organic land were Austria (11%) and Italy (8.4%), followed by the Czech Republic and Greece (both 7.2%). The lowest figures were shown for Malta (0.2%), Poland (0.6%) and Ireland (0.8%). In 2009, the proportion of organic land in the EU grew to 4.7%. The countries with highest share of agricultural land were Liechtenstein (26.9%), Austria (18.5%) and Sweden (12.6%). 16% of all farmers in Austria produced organically in 2010. By the same year the proportion of organic land increased to 20%. : In 2005 168,000 ha (415,000 ac) of land in Poland was under organic management. In 2012, 288,261 hectares (712,308 acres) were under organic production, and there were about 15,500 organic farmers; retail sales of organic products were EUR 80 million in 2011. As of 2012 organic exports were part of the government's economic development strategy. After the collapse of the Soviet Union in 1991, agricultural inputs that had previously been purchased from Eastern bloc countries were no longer available in Cuba, and many Cuban farms converted to organic methods out of necessity. Consequently, organic agriculture is a mainstream practice in Cuba, while it remains an alternative practice in most other countries. Cuba's organic strategy includes development of genetically modified crops; specifically corn that is resistant to the palomilla moth. In 2001, the global market value of certified organic products was estimated at USD $20 billion. By 2002, this was USD $23 billion and by 2015 more than USD $43 billion. By 2014, retail sales of organic products reached USD $80 billion worldwide. North America and Europe accounted for more than 90% of all organic product sales. In 2018 Australia accounted for 54% of the world's certified organic land with the country recording more than 35,000,000 verified organic hectares. Organic agricultural land increased almost fourfold in 15 years, from 11 million hectares in 1999 to 43.7 million hectares in 2014. Between 2013 and 2014, organic agricultural land grew by 500,000 hectares worldwide, increasing in every region except Latin America. During this time period, Europe’s organic farmland increased 260,000 hectares to 11.6 million total (+2.3%), Asia’s increased 159,000 hectares to 3.6 million total (+4.7%), Africa’s increased 54,000 hectares to 1.3 million total (+4.5%), and North America’s increased 35,000 hectares to 3.1 million total (+1.1%). As of 2014, the country with the most organic land was Australia (17.2 million hectares), followed by Argentina (3.1 million hectares), and the United States (2.2 million hectares). Australia's organic land area has increased at a rate of 16.5% per annum for the past eighteen years. In 2013, the number of organic producers grew by almost 270,000, or more than 13%. By 2014, there were a reported 2.3 million organic producers in the world. Most of the total global increase took place in the Philippines, Peru, China, and Thailand. Overall, the majority of all organic producers are in India (650,000 in 2013), Uganda (190,552 in 2014), Mexico (169,703 in 2013) and the Philippines (165,974 in 2014). Studies comparing yields have had mixed results. These differences among findings can often be attributed to variations between study designs including differences in the crops studied and the methodology by which results were gathered. A 2012 meta-analysis found that productivity is typically lower for organic farming than conventional farming, but that the size of the difference depends on context and in some cases may be very small. While organic yields can be lower than conventional yields, another meta-analysis published in Sustainable Agriculture Research in 2015, concluded that certain organic on-farm practices could help narrow this gap. Timely weed management and the application of manure in conjunction with legume forages/cover crops were shown to have positive results in increasing organic corn and soybean productivity. Another meta-analysis published in the journal Agricultural Systems in 2011 analyzed 362 datasets and found that organic yields were on average 80% of conventional yields. The author's found that there are relative differences in this yield gap based on crop type with crops like soybeans and rice scoring higher than the 80% average and crops like wheat and potato scoring lower. Across global regions, Asia and Central Europe were found to have relatively higher yields and Northern Europe relatively lower than the average. A 2007 study compiling research from 293 different comparisons into a single study to assess the overall efficiency of the two agricultural systems has concluded that "organic methods could produce enough food on a global per capita basis to sustain the current human population, and potentially an even larger population, without increasing the agricultural land base." The researchers also found that while in developed countries, organic systems on average produce 92% of the yield produced by conventional agriculture, organic systems produce 80% more than conventional farms in developing countries, because the materials needed for organic farming are more accessible than synthetic farming materials to farmers in some poor countries. This study's methodology and results were contested by D.J. Connor of The University of Melbourne, in a short communication published in Field Crops Research. Connor writes that errors in Badgley et al. result in "major overestimation of the productivity of OA". A study published in 2005 compared conventional cropping, organic animal-based cropping, and organic legume-based cropping on a test farm at the Rodale Institute over 22 years. The study found that "the crop yields for corn and soybeans were similar in the organic animal, organic legume, and conventional farming systems". It also found that "significantly less fossil energy was expended to produce corn in the Rodale Institute’s organic animal and organic legume systems than in the conventional production system. There was little difference in energy input between the different treatments for producing soybeans. In the organic systems, synthetic fertilizers and pesticides were generally not used". As of 2013 the Rodale study was ongoing and a thirty-year anniversary report was published by Rodale in 2012. A long-term field study comparing organic/conventional agriculture carried out over 21 years in Switzerland concluded that "Crop yields of the organic systems averaged over 21 experimental years at 80% of the conventional ones. The fertilizer input, however, was 34 – 51% lower, indicating an efficient production. The organic farming systems used 20 – 56% less energy to produce a crop unit and per land area this difference was 36 – 53%. In spite of the considerably lower pesticide input the quality of organic products was hardly discernible from conventional analytically and even came off better in food preference trials and picture creating methods"
In the United States, organic farming has been shown to be 2.7 to 3.8 times more profitable for the farmer than conventional farming when prevailing price premiums are taken into account. Globally, organic farming is between 22 and 35 percent more profitable for farmers than conventional methods, according to a 2015 meta-analysis of studies conducted across five continents. The profitability of organic agriculture can be attributed to a number of factors. First, organic farmers do not rely on synthetic fertilizer and pesticide inputs, which can be costly. In addition, organic foods currently enjoy a price premium over conventionally produced foods, meaning that organic farmers can often get more for their yield. The price premium for organic food is an important factor in the economic viability of organic farming. In 2013 there was a 100% price premium on organic vegetables and a 57% price premium for organic fruits. These percentages are based on wholesale fruit and vegetable prices, available through the United States Department of Agriculture’s Economic Research Service. Price premiums exist not only for organic versus nonorganic crops, but may also vary depending on the venue where the product is sold: farmers' markets, grocery stores, or wholesale to restaurants. For many producers, direct sales at farmers' markets are most profitable because the farmer receives the entire markup, however this is also the most time and labor-intensive approach. For markets and supermarkets organic food is profitable as well, and is generally sold at significantly higher prices than non-organic food. In the most recent assessments of the energy efficiency of organic versus conventional agriculture, results have been mixed regarding which form is more carbon efficient. Organic farm systems have more often than not been found to be more energy efficient, however, this is not always the case. More than anything, results tend to depend upon crop type and farm size. A comprehensive comparison of energy efficiency in grain production, produce yield, and animal husbandry concluded that organic farming had a higher yield per unit of energy over the vast majority of the crops and livestock systems. For example, two studies - both comparing organically- versus conventionally-farmed apples - declare contradicting results, one saying organic farming is more energy efficient, the other saying conventionally is more efficient. It has generally been found that the labor input per unit of yield was higher for organic systems compared with conventional production. Most sales are concentrated in developed nations. In 2008, 69% of Americans claimed to occasionally buy organic products, down from 73% in 2005. One theory for this change was that consumers were substituting "local" produce for "organic" produce. The USDA requires that distributors, manufacturers, and processors of organic products be certified by an accredited state or private agency. In 2007, there were 3,225 certified organic handlers, up from 2,790 in 2004. Organic handlers are often small firms; 48% reported sales below $1 million annually, and 22% between $1 and $5 million per year. Smaller handlers are more likely to sell to independent natural grocery stores and natural product chains whereas large distributors more often market to natural product chains and conventional supermarkets, with a small group marketing to independent natural product stores. Some handlers work with conventional farmers to convert their land to organic with the knowledge that the farmer will have a secure sales outlet. This lowers the risk for the handler as well as the farmer. In 2004, 31% of handlers provided technical support on organic standards or production to their suppliers and 34% encouraged their suppliers to transition to organic. Smaller farms often join together in cooperatives to market their goods more effectively. 93% of organic sales are through conventional and natural food supermarkets and chains, while the remaining 7% of U.S. organic food sales occur through farmers' markets, foodservices, and other marketing channels. In the 2012 Census, direct-to-consumer sales equaled $1.3 billion, up from $812 million in 2002, an increase of 60 percent. The number of farms that utilize direct-to-consumer sales was 144,530 in 2012 in comparison to 116,733 in 2002. Direct-to-consumer sales include farmers' markets, community supported agriculture (CSA), on-farm stores, and roadside farm stands. Some organic farms also sell products direct to retailer, direct to restaurant and direct to institution. According to the 2008 Organic Production Survey, approximately 7% of organic farm sales were direct-to-consumers, 10% went direct to retailers, and approximately 83% went into wholesale markets. In comparison, only 0.4% of the value of convention agricultural commodities were direct-to-consumers. While not all products sold at farmer’s markets are certified organic, this direct-to-consumer avenue has become increasingly popular in local food distribution and has grown substantially since 1994. In 2014, there were 8,284 farmer’s markets in comparison to 3,706 in 2004 and 1,755 in 1994, most of which are found in populated areas such as the Northeast, Midwest, and West Coast. Organic production is more labor-intensive than conventional production. On the one hand, this increased labor cost is one factor that makes organic food more expensive. On the other hand, the increased need for labor may be seen as an "employment dividend" of organic farming, providing more jobs per unit area than conventional systems. The 2011 UNEP Green Economy Report suggests that "[a]n increase in investment in green agriculture is projected to lead to growth in employment of about 60 per cent compared with current levels" and that "green agriculture investments could create 47 million additional jobs compared with BAU2 over the next 40 years." The United Nations Environment Programme (UNEP) also argues that "[b]y greening agriculture and food distribution, more calories per person per day, more jobs and business opportunities especially in rural areas, and market-access opportunities, especially for developing countries, will be available." In 2007 the United Nations Food and Agriculture Organization (FAO) said that organic agriculture often leads to higher prices and hence a better income for farmers, so it should be promoted. However, FAO stressed that by organic farming one could not feed the current mankind, even less the bigger future population. Both data and models showed then that organic farming was far from sufficient. Therefore, chemical fertilizers were needed to avoid hunger. Other analysis by many agribusiness executives, agricultural and ecological scientists, and international agriculture experts revealed the opinion that organic farming would not only increase the world's food supply, but might be the only way to eradicate hunger. FAO stressed that fertilizers and other chemical inputs can much increase the production, particularly in Africa where fertilizers are currently used 90% less than in Asia. For example, in Malawi the yield has been boosted using seeds and fertilizers. FAO also calls for using biotechnology, as it can help smallholder farmers to improve their income and food security. Also NEPAD, development organization of African governments, announced that feeding Africans and preventing malnutrition requires fertilizers and enhanced seeds. According to a 2012 study in ScienceDigest, organic best management practices shows an average yield only 13% less than conventional. In the world's poorer nations where most of the world's hungry live, and where conventional agriculture's expensive inputs are not affordable by the majority of farmers, adopting organic management actually increases yields 93% on average, and could be an important part of increased food security. Organic agriculture can contribute to ecological sustainability, especially in poorer countries. The application of organic principles enables employment of local resources (e.g., local seed varieties, manure, etc.) and therefore cost-effectiveness. Local and international markets for organic products show tremendous growth prospects and offer creative producers and exporters excellent opportunities to improve their income and living conditions. Organic agriculture is knowledge intensive. Globally, capacity building efforts are underway, including localized training material, to limited effect. As of 2007, the International Federation of Organic Agriculture Movements hosted more than 170 free manuals and 75 training opportunities online. In 2008 the United Nations Environmental Programme (UNEP) and the United Nations Conference on Trade and Development (UNCTAD) stated that "organic agriculture can be more conducive to food security in Africa than most conventional production systems, and that it is more likely to be sustainable in the long-term" and that "yields had more than doubled where organic, or near-organic practices had been used" and that soil fertility and drought resistance improved. The value of organic agriculture (OA) in the achievement of the Millennium Development Goals (MDG), particularly in poverty reduction efforts in the face of climate change, is shown by its contribution to both income and non-income aspects of the MDGs. These benefits are expected to continue in the post-MDG era. A series of case studies conducted in selected areas in Asian countries by the Asian Development Bank Institute (ADBI) and published as a book compilation by ADB in Manila document these contributions to both income and non-income aspects of the MDGs. These include poverty alleviation by way of higher incomes, improved farmers' health owing to less chemical exposure, integration of sustainable principles into rural development policies, improvement of access to safe water and sanitation, and expansion of global partnership for development as small farmers are integrated in value chains. A related ADBI study also sheds on the costs of OA programs and set them in the context of the costs of attaining the MDGs. The results show considerable variation across the case studies, suggesting that there is no clear structure to the costs of adopting OA. Costs depend on the efficiency of the OA adoption programs. The lowest cost programs were more than ten times less expensive than the highest cost ones. However, further analysis of the gains resulting from OA adoption reveals that the costs per person taken out of poverty was much lower than the estimates of the World Bank, based on income growth in general or based on the detailed costs of meeting some of the more quantifiable MDGs (e.g., education, health, and environment). Agriculture imposes negative externalities (uncompensated costs) upon society through public land and other public resource use, biodiversity loss, erosion, pesticides, nutrient runoff, subsidized water usage, subsidy payments and assorted other problems. Positive externalities include self-reliance, entrepreneurship, respect for nature, and air quality. Organic methods reduce some of these costs. In 2000 uncompensated costs for 1996 reached 2,343 million British pounds or £208 per ha (£84.20/ac). A study of practices in the US published in 2005 concluded that cropland costs the economy approximately 5 to 16 billion dollars ($30–96/ha – $12–39/ac), while livestock production costs 714 million dollars. Both studies recommended reducing externalities. The 2000 review included reported pesticide poisonings but did not include speculative chronic health effects of pesticides, and the 2004 review relied on a 1992 estimate of the total impact of pesticides. It has been proposed that organic agriculture can reduce the level of some negative externalities from (conventional) agriculture. Whether the benefits are private or public depends upon the division of property rights. Several surveys and studies have attempted to examine and compare conventional and organic systems of farming and have found that organic techniques, while not without harm, are less damaging than conventional ones because they reduce levels of biodiversity less than conventional systems do and use less energy and produce less waste when calculated per unit area. A 2003 to 2005 investigation by the Cranfield University for the Department for Environment, Food and Rural Affairs in the UK found that it is difficult to compare the Global warming potential, acidification and eutrophication emissions but "Organic production often results in increased burdens, from factors such as N leaching and N2O emissions", even though primary energy use was less for most organic products. N2O is always the largest global warming potential contributor except in tomatoes. However, "organic tomatoes always incur more burdens (except pesticide use)". Some emissions were lower "per area", but organic farming always required 65 to 200% more field area than non-organic farming. The numbers were highest for bread wheat (200+ % more) and potatoes (160% more). Proponents of organic farming have claimed that organic agriculture emphasizes closed nutrient cycles, biodiversity, and effective soil management providing the capacity to mitigate and even reverse the effects of climate change and that organic agriculture can decrease fossil fuel emissions. "The carbon sequestration efficiency of organic systems in temperate climates is almost double (575–700 kg carbon per ha per year – 510–625 lb/ac/an ) that of conventional treatment of soils, mainly owing to the use of grass clovers for feed and of cover crops in organic rotations." Critics of organic farming methods believe that the increased land needed to farm organic food could potentially destroy the rainforests and wipe out many ecosystems. According to a 2012 meta-analysis of 71 studies, nitrogen leaching, nitrous oxide emissions, ammonia emissions, eutrophication potential and acidification potential were higher for organic products, although in one study "nitrate leaching was 4.4–5.6 times higher in conventional plots than organic plots". Excess nutrients in lakes, rivers, and groundwater can cause algal blooms, eutrophication, and subsequent dead zones. In addition, nitrates are harmful to aquatic organisms by themselves. The Oxford meta-analysis of 71 studies found that organic farming requires 84% more land for an equivalent amount of harvest, mainly due to lack of nutrients but sometimes due to weeds, diseases or pests, lower yielding animals and land required for fertility building crops. While organic farming does not necessarily save land for wildlife habitats and forestry in all cases, the most modern breakthroughs in organic are addressing these issues with success. Professor Wolfgang Branscheid says that organic animal production is not good for the environment, because organic chicken requires twice as much land as "conventional" chicken and organic pork a quarter more. According to a calculation by Hudson Institute, organic beef requires three times as much land. On the other hand, certain organic methods of animal husbandry have been shown to restore desertified, marginal, and/or otherwise unavailable land to agricultural productivity and wildlife. Or by getting both forage and cash crop production from the same fields simultaneously, reduce net land use. In England organic farming yields 55% of normal yields. In other regions of the world, organic methods have started producing record yields. In organic farming synthetic pesticides are generally prohibited. A chemical is said to be synthetic if it does not already exist in the natural world. But the organic label goes further and usually prohibit compounds that exist in nature if they are produced by chemical synthesis. So the prohibition is also about the method of production and not only the nature of the compound. Boric acid is used as stomach poison that target insects (LD50: 2660 mg/kg). Pyrethrin comes from chemicals extracted from flowers of the genus Pyrethrum (LD50 of 370 mg/kg). Its potent toxicity is used to control insects. Rotenone is a powerful insecticide that was used to control insects (LD50: 132 mg/kg). Despite the high toxicity of Rotenone to aquatic life and some links to Parkinson disease the compound is still allowed in organic farming as it is a naturally occurring compound. Azadirachtin is a wide spectrum very potent insecticide. Almost non toxic to mammals (LD50 in rats is > 3,540 mg/kg) but affects beneficial insects. While there may be some differences in the amounts of nutrients and anti-nutrients when organically produced food and conventionally produced food are compared, the variable nature of food production and handling makes it difficult to generalize results, and there is insufficient evidence to make claims that organic food is safer or healthier than conventional food. Claims that organic food tastes better are not supported by evidence. Supporters claim that organically managed soil has a higher quality and higher water retention. This may help increase yields for organic farms in drought years. Organic farming can build up soil organic matter better than conventional no-till farming, which suggests long-term yield benefits from organic farming. An 18-year study of organic methods on nutrient-depleted soil concluded that conventional methods were superior for soil fertility and yield for nutrient-depleted soils in cold-temperate climates, arguing that much of the benefit from organic farming derives from imported materials that could not be regarded as self-sustaining. In Dirt: The Erosion of Civilizations, geomorphologist David Montgomery outlines a coming crisis from soil erosion. Agriculture relies on roughly one meter of topsoil, and that is being depleted ten times faster than it is being replaced. No-till farming, which some claim depends upon pesticides, is one way to minimize erosion. However, a 2007 study by the USDA's Agricultural Research Service has found that manure applications in tilled organic farming are better at building up the soil than no-till. The conservation of natural resources and biodiversity is a core principle of organic production. Three broad management practices (prohibition/reduced use of chemical pesticides and inorganic fertilizers; sympathetic management of non-cropped habitats; and preservation of mixed farming) that are largely intrinsic (but not exclusive) to organic farming are particularly beneficial for farmland wildlife. Using practices that attract or introduce beneficial insects, provide habitat for birds and mammals, and provide conditions that increase soil biotic diversity serve to supply vital ecological services to organic production systems. Advantages to certified organic operations that implement these types of production practices include: 1) decreased dependence on outside fertility inputs; 2) reduced pest management costs; 3) more reliable sources of clean water; and 4) better pollination. Nearly all non-crop, naturally occurring species observed in comparative farm land practice studies show a preference for organic farming both by abundance and diversity. An average of 30% more species inhabit organic farms. Birds, butterflies, soil microbes, beetles, earthworms, spiders, vegetation, and mammals are particularly affected. Lack of herbicides and pesticides improve biodiversity fitness and population density. Many weed species attract beneficial insects that improve soil qualities and forage on weed pests. Soil-bound organisms often benefit because of increased bacteria populations due to natural fertilizer such as manure, while experiencing reduced intake of herbicides and pesticides. Increased biodiversity, especially from beneficial soil microbes and mycorrhizae have been proposed as an explanation for the high yields experienced by some organic plots, especially in light of the differences seen in a 21-year comparison of organic and control fields. Biodiversity from organic farming provides capital to humans. Species found in organic farms enhance sustainability by reducing human input (e.g., fertilizers, pesticides). The USDA’s Agricultural Marketing Service (AMS) published a Federal Register notice on 15 January 2016, announcing the National Organic Program (NOP) final guidance on Natural Resources and Biodiversity Conservation for Certified Organic Operations. Given the broad scope of natural resources which includes soil, water, wetland, woodland and wildlife, the guidance provides examples of practices that support the underlying conservation principles and demonstrate compliance with USDA organic regulations § 205.200. The final guidance provides organic certifiers and farms with examples of production practices that support conservation principles and comply with the USDA organic regulations, which require operations to maintain or improve natural resources. The final guidance also clarifies the role of certified operations (to submit an OSP to a certifier), certifiers (ensure that the OSP describes or lists practices that explain the operator's monitoring plan and practices to support natural resources and biodiversity conservation), and inspectors (onsite inspection) in the implementation and verification of these production practices. A wide range of organisms benefit from organic farming, but it is unclear whether organic methods confer greater benefits than conventional integrated agri-environmental programs. Organic farming is often presented as a more biodiversity-friendly practice, but the generality of the beneficial effects of organic farming is debated as the effects appear often species- and context-dependent, and current research has highlighted the need to quantify the relative effects of local- and landscape-scale management on farmland biodiversity. There are four key issues when comparing the impacts on biodiversity of organic and conventional farming: (1) It remains unclear whether a holistic whole-farm approach (i.e. organic) provides greater benefits to biodiversity than carefully targeted prescriptions applied to relatively small areas of cropped and/or non-cropped habitats within conventional agriculture (i.e. agri-environment schemes); (2) Many comparative studies encounter methodological problems, limiting their ability to draw quantitative conclusions; (3) Our knowledge of the impacts of organic farming in pastoral and upland agriculture is limited; (4) There remains a pressing need for longitudinal, system-level studies in order to address these issues and to fill in the gaps in our knowledge of the impacts of organic farming, before a full appraisal of its potential role in biodiversity conservation in agroecosystems can be made. Organic agriculture is often considered to be more socially just and economically sustainable for farmworkers than conventional agriculture. However, there is little social science research or consensus as to whether or not organic agriculture provides better working conditions than conventional agriculture. As many consumers equate organic and sustainable agriculture with small-scale, family-owned organizations it is widely interpreted that buying organic supports better conditions for farmworkers than buying with conventional producers. Organic agriculture is generally more labor-intensive due to its dependence on manual practices for fertilization and pest removal and relies heavily upon hired, non-family farmworkers rather than family members. Although illnesses from synthetic inputs pose less of a risk, hired workers still fall victim to debilitating musculoskeletal disorders associated with agricultural work. The USDA certification requirements outline growing practices and ecological standards but do nothing to codify labor practices. Independent certification initiatives such as the Agricultural Justice Project, Domestic Fair Trade Working Group, and the Food Alliance have attempted to implement farmworker interests but because these initiatives require voluntary participation of organic farms, their standards cannot be widely enforced.Despite the benefit to farmworkers of implementing labor standards, there is little support among the organic community for these social requirements. Many actors of the organic industry believe that enforcing labor standards would be unnecessary, unacceptable, or unviable due to the constraints of the market. The Chinese government, especially the local government, has provided various supports for the development of organic agriculture since the 1990s. Organic farming has been recognized by local governments for its potential in promoting sustainable rural development. It is common for local governments to facilitate land access of agribusinesses by negotiating land leasing with local farmers. The government also establishes demonstration organic gardens, provides training for organic food companies to pass certifications, subsidizes organic certification fees, pest repellent lamps, organic fertilizer and so on. The government has also been playing an active role in marketing organic products through organizing organic food expos and branding supports. In India, in 2016, the northern state of Sikkim achieved its goal of converting to 100% organic farming. Other states of India, including Kerala, Mizoram, Goa, Rajasthan, and Meghalaya, have also declared their intentions to shift to fully organic cultivation. The Dominican Republic has successfully converted a large amount of its banana crop to organic. The Dominican Republic accounts for 55% of the world’s certified organic bananas. In Thailand, the Institute for Sustainable Agricultural Communities (ISAC) was established in 1991 to promote organic farming (among other sustainable agricultural practices). The national target via the National Plan for Organic Farming is to attain, by 2021, 1.3 million rai of organically farmed land. Another target is for 40% of the produce from these farmlands to be consumed domestically. ^ a b Paull, John & Hennig, Benjamin (2016) Atlas of Organics: Four Maps of the World of Organic Agriculture Journal of Organics. 3(1): 25-32. ^ "USDA List of Allowed and Prohibited Substances in Organic Agriculture". USDA List of Allowed and Prohibited Substances in Organic Agriculture. USDA. 4 April 2016. Retrieved 6 April 2016. ^ Arsenault, Chris. "Only 60 Years of Farming Left If Soil Degradation Continues". Scientific American. Retrieved 29 May 2016. ^ a b Coleman, Eliot (1995), The New Organic Grower: A Master's Manual of Tools and Techniques for the Home and Market Gardener (2nd ed. ), pp. 65, 108, ISBN 978-0930031756. ^ Danielle Treadwell, Jim Riddle, Mary Barbercheck, Deborah Cavanaugh-Grant, Ed Zaborski, Cooperative Extension System, What is organic farming? ^ Dale Rhoads, Purdue Extension Service, What is organic farming? ^ Gold, Mary. "What is organic production?". National Agricultural Library. USDA. Retrieved 1 March 2014. ^ Helga Willer, Julia Lernoud and Robert Home The World of Organic Agriculture: Statistics & Emerging Trends 2013, Research Institute of Organic Agriculture (FiBL) and the International Federation of Organic Agriculture Movements (IFOAM, 2013). ^ "The World of Organic Agriculture 2019". FiBL and IFOAM. Retrieved 15 March 2019. ^ Horne, Paul Anthony (2008). Integrated pest management for crops and pastures. CSIRO Publishing. p. 2. ISBN 978-0-643-09257-0. ^ a b Stinner, D.H (2007). "The Science of Organic Farming". In William Lockeretz (ed.). Organic Farming: An International History. Oxfordshire, UK & Cambridge, Massachusetts: CAB International (CABI). ISBN 978-1-84593-289-3. Retrieved 30 April 2013. ^ a b c Paull, John (2011). "Attending the First Organic Agriculture Course: Rudolf Steiner's Agriculture Course at Koberwitz, 1924". European Journal of Social Sciences. 21 (1): 64–70. ^ Vogt G (2007). Lockeretz W (ed.). Chapter 1: The Origins of Organic Farming. Organic Farming: An International History. CABI Publishing. pp. 9–30. ISBN 9780851998336. ^ Lotter, D.W. (2003). "Organic agriculture" (PDF). Journal of Sustainable Agriculture. 21 (4): 59–128. doi:10.1300/J064v21n04_06. ^ a b Kirchmann, Holger; Bergstrom, Lars (16 December 2008). Organic Crop Production - Ambitions and Limitations. Springer Science & Business Media. pp. 2–. ISBN 978-1-4020-9316-6. ^ Diver (1999), "Introduction" Archived 26 May 2011 at the Wayback Machine. ^ Paull, John (2011). "The secrets of Koberwitz: the diffusion of Rudolf Steiner's agriculture course and the founding of biodynamic agriculture". Journal of Social Research & Policy. 2 (1): 19–29. ^ Paull, John (2011). "Biodynamic Agriculture: The Journey from Koberwitz to the World, 1924-1938". Journal of Organic Systems. 6 (1): 27–41. ^ a b c Paull, John (2011) "The Betteshanger Summer School: Missing link between biodynamic agriculture and organic farming", Journal of Organic Systems, 6(2):13-26. ^ Nayler, Justin. "Second Thoughts About Organic Agriculture" (PDF). Soil And Health Library. Retrieved 11 May 2014. ^ Diver, Steve. "Controlled Microbial Composting and Humus Management: Luebke Compost". Retrieved 11 May 2014. ^ "Definition of Organic Agriculture". IFOAM. Retrieved 30 September 2008. ^ "Integrated Pest Management". U.S. Environmental Protection Agency. Retrieved 1 January 2013. ^ a b c Watson CA, Atkinson D, Gosling P, Jackson LR, Rayns FW (2002). "Managing soil fertility in organic farming systems". Soil Use and Management. 18: 239–247. doi:10.1111/j.1475-2743.2002.tb00265.x. Preprint with free full-text. ^ a b c Gillman J. (2008). The Truth About Organic Farming. ^ Ingram, M. (2007). "Biology and Beyond: The Science of Back to Nature Farming in the United States". Annals of the Association of American Geographers. 97 (2): 298–312. doi:10.1111/j.1467-8306.2007.00537.x. ^ a b Fließbach, A.; Oberholzer, H.; Gunst, L.; Mäder, P. (2006). "Soil organic matter and biological soil quality indicators after 21 years of organic and conventional farming". Agriculture, Ecosystems and Environment. 118 (1–4): 273–284. doi:10.1016/j.agee.2006.05.022. ^ a b c Kathleen Delate and Robert Hartzler. 2003. Weed Management for Organic Farmers. Iowa State University Extension Bulletin 1883. ^ Kremer, Robert J.; Li, Jianmei (2003). "Developing weed-suppressive soils through improved soil quality management". Soil & Tillage Research. 72 (2): 193–202. doi:10.1016/s0167-1987(03)00088-6. ^ a b Mark Schonbeck, Virginia Association for Biological Farming. Last Updated: 23 March 2010. An Organic Weed Control Toolbox Archived 28 August 2010 at the Wayback Machine. ^ Szykitka, Walter (2004). The Big Book of Self-Reliant Living: Advice and Information on Just About Everything You Need to Know to Live on Planet Earth. Globe-Pequot. p. 343. ISBN 978-1-59228-043-8. ^ a b Staff, Green.View (11 August 2008). "Stuck in the mud". The Economist. ^ Pimentel, D; et al. (2005). "Environmental, Energetic, and Economic Comparisons of Organic and Conventional Farming Systems" (PDF). BioScience. 55 (7): 573–82. doi:10.1641/0006-3568(2005)055[0573:eeaeco]2.0.co;2. Archived from the original (PDF) on 1 June 2013. Retrieved 2 February 2013. ^ a b c d Lotter, D. (2003). "Organic Agriculture" (PDF). Journal of Sustainable Agriculture. 21 (4): 59. doi:10.1300/J064v21n04_06. ^ Panov, A.; Dikalov, S; Shalbuyeva, N; Taylor, G; Sherer, T; Greenamyre, JT (2005). "Rotenone Model of Parkinson Disease: MULTIPLE BRAIN MITOCHONDRIA DYSFUNCTIONS AFTER SHORT TERM SYSTEMIC ROTENONE INTOXICATION". Journal of Biological Chemistry. 280 (51): 42026–35. doi:10.1074/jbc.M508628200. PMID 16243845. ^ Sherer, TB; Betarbet, R; Testa, CM; Seo, BB; Richardson, JR; Kim, JH; Miller, GW; Yagi, T; Matsuno-Yagi, A; Greenamyre, JT (2003). "Mechanism of toxicity in rotenone models of Parkinson's disease". The Journal of Neuroscience. 23 (34): 10756–64. doi:10.1523/JNEUROSCI.23-34-10756.2003. PMID 14645467. ^ Jones, D. 1998. Piperonyl butoxide: the insecticide synergist. Academic Press, London. 323 pp. ^ a b Canadian General Standards Board. CAN/CGSB-32.311-2006. ^ a b OGA. 2004. OGA standard. Organic Growers of Australia. Inc. 32 pp. ^ Scheuerell SJ, Mahaffee WF (2004). "Compost tea as a container medium drench for suppressing seedling damping-off caused by Pythium". Phytopathology. 94 (11): 1156–1163. doi:10.1094/PHYTO.2004.94.11.1156. PMID 18944450. ^ Brinton W, et al. (2004). "Compost teas: Microbial hygiene and quality in relation to method of preparation" (PDF). Biodynamics: 36–45. Retrieved 15 April 2009. ^ a b c "USDA National Organic Program, Subpart G. The National List of Allowed and Prohibited Substances". Archived from the original on 12 June 2011. Retrieved 19 October 2010. ^ Edwards-Jones, G; Howells, O (2001). "The origin and hazard of inputs to crop protection in organic farming systems: Are they sustainable?". Agricultural Systems. 67: 31. doi:10.1016/S0308-521X(00)00045-7. ^ Leake, A. R. 1999. House of Lords Select Committee on the European Communities. Session 1998-99, 16th Report. Organic Farming and the European Union. p. 81. Cited by Trewavas, A (2004). "A critical assessment of organic farming-and-food assertions with particular respect to the UK and the potential environmental benefits of no-till agriculture". Crop Protection. 23 (9): 757–781. doi:10.1016/j.cropro.2004.01.009. ^ "European organic farming research projects". Organic Research. Archived from the original on 10 January 2014. Retrieved 10 January 2014. ^ "Agricultural Marketing Service". www.ams.usda.gov. Retrieved 17 December 2018. ^ "Organic Standards - Agricultural Marketing Service". ^ Luis Herrera-Estrella; Ariel Alvarez-Morales (April 2001). "Genetically modified crops: hope for developing countries?". EMBO Reports. 2 (4): 256–258. doi:10.1093/embo-reports/kve075. PMC 1083872. PMID 11306538. ^ Pamela Ronald; Raoul Adamchak (April 2018). Tomorrow's Table: Organic Farming, Genetics and the Future of Food. Oxford University Press. ISBN 978-0199342082. ^ "EUR-Lex - l21118 - EN - EUR-Lex". ^ USDA NOP Program Standards. Retrieved 2 April 2008. ^ "Welcome to the Organic Materials Review Institute". ^ "Organic food: the hidden dangers that might surprise you". The New Daily. 29 August 2014. ^ "National Organic Program Regulations". Archived from the original on 11 December 2007. Retrieved 27 November 2007. ^ Halberg, Niels (2006). Global development of organic agriculture: challenges and prospects. CABI. p. 297. ISBN 978-1-84593-078-3. ^ Paull, John & Hennig, Benjamin (2018) Maps of Organic Agriculture in Australia, Journal of Organics. 5 (1): 29–39. ^ "Organic Farming in the European Union" (PDF). European Commission. p. 30. Archived from the original (PDF) on 6 September 2012. Retrieved 19 January 2012. ^ European Commission – Eurostat. "Eurostat press release 80/2007" (PDF). p. 1. Archived from the original (PDF) on 29 November 2007. Retrieved 7 October 2007. ^ Bauernzeitung (RollAMA survey). "Bio hat Zukunft, aber auch viele Probleme". Retrieved 19 January 2012. ^ SixtyTwo International Consultants. "The organic food market in Poland: Ready for take-off". Archived from the original on 27 September 2007. Retrieved 8 October 2007. ^ Auld, Alison. "Farming with Fidel". Archived from the original on 4 March 2009. Retrieved 4 February 2012. ^ McNeil, Maggie (2016). "U.S. organic sales post new record of $43.3 billion in 2015". OTA. ^ a b c d e f g h i j Willer, Helga; Lernoud, Julia (2016). "The World of Organic Agriculture. Statistics and Emerging Trends 2016". Bonn: Research Institute of Organic Agriculture (FiBL), Frick, and IFOAM – Organics International. ^ a b Paull, John & Hennig, Benjamin (2018) Maps of Organic Agriculture in Australia, Journal of Organics. 5 (1): 29–39. ^ Welsh, Rick (1999). "Economics of Organic Grain and Soybean Production in the Midwestern United States". Henry A. Wallace Institute for Alternative Agriculture. ^ Seufert, Verena; Ramankutty, Navin; Foley, Jonathan A. (2012). "Comparing the yields of organic and conventional agriculture". Nature. 485 (7397): 229–232. Bibcode:2012Natur.485..229S. doi:10.1038/nature11069. ^ de Pont, Tomek; Rijk, Bert; van Ittersum, Martin K. (19 December 2011). "The crop yield gap between organic and conventional agriculture". Agricultural Systems. 108: 1–9. doi:10.1016/j.agsy.2011.12.004. ^ Badgley, Catherine; Moghtader, Jeremy; Quintero, Eileen; Zakem, Emily; Chappell, M. Jahi; Avilés-Vázquez, Katia; Samulon, Andrea; Perfecto, Ivette (2007). "Organic agriculture and the global food supply". Renewable Agriculture and Food Systems. 22 (2): 86. doi:10.1017/S1742170507001640. Lay summary – New Scientist (12 July 2007). ^ Connor, D. J. (2008). "Organic agriculture cannot feed the world" (PDF). Field Crops Res. 106 (2): 187–190. doi:10.1016/j.fcr.2007.11.010. ^ Pimentel DP et al. (2005) Environmental, Energetic, and Economic Comparisons of Organic and Conventional Farming Systems Archived 1 June 2013 at the Wayback Machine Bioscience 55(7): 573-582. ^ "Farming Systems Trial: Overview - Rodale Institute". ^ "The Farming Systems Trial Rodale 30 year report" (PDF). Retrieved 7 March 2017. ^ Fliessbach, et al. (Research Institute of Organic Agriculture), "D-O-K (Biodynamic-Bioorganic-Conventional): Results From 21 Year Old Field Experiment". ^ Moyer, Jeff (2013). "Perspective on Rodale Institute's Farming Systems Trial". Crop Management. ^ a b Crowder, David W.; Reganold, John P. (16 June 2015). "Financial competitiveness of organic agriculture on a global scale". Proceedings of the National Academy of Sciences. 112 (24): 7611–7616. Bibcode:2015PNAS..112.7611C. doi:10.1073/pnas.1423674112. ISSN 0027-8424. PMC 4475942. PMID 26034271. ^ Greene, Catherine. "USDA Economic Research Service - Organic Prices". www.ers.usda.gov. Retrieved 25 March 2016. ^ Post, Emily (2012). Understanding Organic Pricing and Costs of Production. NCAT. ^ a b McBride, William D.; Greene, Catherine R. (2013). "Organic Data and Research from the ARMS Survey: Findings on Competitiveness of the Organic Soybean Sector". Crop Management. ^ Martin, Andrew; Kim Severson (18 April 2008). "Sticker Shock in the Organic Aisles". New York Times. Retrieved 5 March 2015. ^ a b c Pimental; Berardi, Gigi; Fast, Sarah; et al. (1983). "Energy efficiency of farming systems: Organic and conventional agriculture". Agriculture, Ecosystems & Environment. 9 (4): 359–372. doi:10.1016/0167-8809(83)90021-X. ^ Dalgaard; Halberg, Niels; Porter, John R.; et al. (2001). "A model for fossil energy use in Danish agriculture used to compare organic and conventional farming" (PDF). Agriculture, Ecosystems and Environment. 87: 51–65. doi:10.1016/S0167-8809(00)00297-8. ^ Reganold; Glover, JD; Andrews, PK; Hinman, HR; et al. (April 2001). "Sustainability of three apple production systems". Nature. 410 (6831): 926–930. doi:10.1038/35073574. PMID 11309616. ^ The Hartman Group Organic Marketplace Reports. ^ a b Dimitri, Carolyn; Oberholtzer, Lydia (October 2008). "Using Vertically Coordinated Relationships To Overcome Tight Supply in the Organic Market" (PDF). USDA. Archived from the original (PDF) on 18 May 2016. Retrieved 19 April 2016. ^ Oberholtzer, Carolyn Dimitri, Lydia. "USDA Economic Research Service - U.S. Organic Handlers Mostly Small, Focus on Fruit and Vegetables". www.ers.usda.gov. Archived from the original on 26 April 2016. Retrieved 19 April 2016. ^ Greene, Catherine. "USDA Economic Research Service - Organic Market Overview". www.ers.usda.gov. Retrieved 19 April 2016. ^ "2012 Census Drilldown: Organic and Local Food | National Sustainable Agriculture Coalition". sustainableagriculture.net. Retrieved 19 April 2016. ^ Low, Sarah (November 2011). "Direct and Intermediated Marketing of Local Foods in the United States" (PDF). USDA. Archived from the original (PDF) on 18 May 2016. Retrieved 18 April 2016. ^ Vogel, Stephen (August 2014). "Number of U.S. farmers' markets continues to rise". USDA. Archived from the original on 26 April 2016. Retrieved 19 April 2016. ^ a b c Organic agriculture can contribute to fighting hunger - But chemical fertilizers needed to feed the world, FAO, 10 December 2007, Rome. ^ a b Halweil, Brian. "Can Organic Farming Feed Us All?". World Watch Magazine. Retrieved 2 March 2014. ^ Overcoming smallholder challenges with biotechnology, FAO, 29 October 2013, Rome. ^ Meeting Africa's Food Challenge, The New Partnership for Africa's Development (NEPAD), 9–13 June 2006, Abuja, Nigeria. ^ "Can organic food feed the world? New study sheds light on debate over organic vs. conventional agriculture". Science Daily. Retrieved 2 March 2014. ^ De Schutter, Olivier. "Report submitted by the Special Rapporteur on the right to food" (PDF). United Nations. Retrieved 3 March 2014. ^ "ICapacity Building Study 3: Organic Agriculture and Food Security in East Africa" (PDF). University of Essex. Archived from the original (PDF) on 1 December 2007. ^ Lockie, S. (2006). Going organic : mobilizing networks for environmentally responsible food production. Wallingford: CABI. ISBN 9781845931582. OCLC 297145982. ^ UNEP-UNCTAD. (2008). Organic Agriculture and Food Security in Africa. United Nations. Free full-text. ^ Howden D. Organic farming 'could feed Africa'. The Independent. ^ [permanent dead link] Setboonsarng, S. "Organic Agriculture, Poverty Reduction, Climate Change, and the Millennium Development Goals". In Organic Agriculture and Post-2015 Development Goals: Building on the Comparative Advantage of Poor Farmers. Ed. Setboonsarng, S. and A. Markandya. pp 3-48. 2015. Manila: ADB. ^ World Bank. 2008. Global Monitoring Report 2008: MDGs and the Environment: Agenda for Inclusive and Sustainable Development. Washington, DC: World Bank. ^ [permanent dead link] Markandya, A., S. Setboonsarng, YH Qiao, R. Songkranok, and A. Stefan S. "The Costs of Achieving the Millennium Development Goals through Adopting Organic Agriculture." In Organic Agriculture and Post-2015 Development Goals: Building on the Comparative Advantage of Poor Farmers. Ed. Setboonsarng, S. and A. Markandya. pp 49-78. 2015. Manila: ADB. ^ Marshall, G. (1991). "Organic Farming: Should Government Give it More Technical Support?" (PDF). Review of Marketing and Agricultural Economics. 59 (3): 283–296. ^ Pretty, J; Brett, C.; Gee, D.; Hine, R.E. ; Mason, C.F. ; Morison, J.I.L. ; Raven, H.; Rayment, M.D. ; Van Der Bijl, G.; et al. (2000). "An assessment of the total external costs of UK agriculture" (PDF). Agricultural Systems. 65 (2): 113–136. doi:10.1016/S0308-521X(00)00031-7. Archived from the original (PDF) on 18 April 2010. ^ Tegtmeier, E.M.; Duffy, M. (2005). "External Costs of Agricultural Production in the United States" (PDF). The Earthscan Reader in Sustainable Agriculture. ^ New Zealand's Ministry of Agriculture and Forestry. "A Review of the Environmental/Public Good Costs and Benefits of Organic Farming and an Assessment of How Far These Can be Incorporated into Marketable Benefits". Archived from the original on 15 October 2008. Retrieved 20 April 2008. ^ Stolze, M.; Piorr, A.; Häring, A.M. and Dabbert, S. (2000) Environmental impacts of organic farming in Europe. Organic Farming in Europe: Economics and Policy Vol. 6. Universität Hohenheim, Stuttgart-Hohenheim. ^ Hansen, Birgitt; Alrøe, H. J.; Kristensen, E. S. (January 2001). "Approaches to assess the environmental impact of organic farming with particular regard to Denmark". Agriculture, Ecosystems & Environment. 83 (1–2): 11–26. doi:10.1016/S0167-8809(00)00257-7. ^ Determining the environmental burdens and resource use in the production of agricultural and horticultural commodities Archived 29 March 2014 at the Wayback Machine, Williams, A.G. et al., Cranfield University, U.K., August 2006. Organic Agriculture Centre of Canada. ^ Determining the environmental burdens and resource use in the production of agricultural and horticultural commodities. - IS0205 Archived 27 September 2013 at the Wayback Machine, Williams, A.G. et al., Cranfield University, U.K., August 2006. Svensk mat- och miljöinformation. Pages 4-6, 29 and 84-85. ^ a b c d "Organic farms not necessarily better for environment" (PDF). University of Oxford. 12 September 2004. ^ Goldberg, Bob. "The Hypocrisy of Organic Farmers". AgBioWorld. Retrieved 10 October 2007. ^ Leonard, Andrew. "Save the rain forest -- boycott organic?". How The World Works. Retrieved 10 October 2007. ^ Kramer, SB; Reganold, JP; Glover, JD; Bohannan, BJ; Mooney, HA (21 March 2006). "Reduced nitrate leaching and enhanced dentrifier activity and efficiency in organically fertilized soils". Proceedings of the National Academy of Sciences. 103 (12): 4522–7. Bibcode:2006PNAS..103.4522K. doi:10.1073/pnas.0600359103. PMC 1450204. PMID 16537377. ^ Tilman, D; Fargione, J; Wolff, B; d'Antonio, C; Dobson, A; Howarth, R; Schindler, D; Schlesinger, WH; Simberloff, D; Swackhamer, D (21 March 2006). "Forecasting Agriculturally Driven Global Climate Change". Science. 292 (5515): 281–4. Bibcode:2001Sci...292..281T. doi:10.1126/science.1057544. PMID 11303102. ^ "Rodale Institute Farming Systems Trial". Rodale Institute. Retrieved 24 February 2014. ^ Undersander, Dan; et al. "Pastures for Profit: A Guide to Rotational Grazing" (PDF). University of Wisconsin. Cooperative extension publishing. Retrieved 24 February 2014. ^ Undersander, Dan; et al. "Grassland Birds: Fostering Habitats Using Rotational Grazing" (PDF). University of Wisconsin. Cooperative extension publishing. Retrieved 24 February 2014. ^ The Environmental Safety and Benefits of Growth Enhancing Pharmaceutical Technologies in Beef Production Archived 18 April 2013 at the Wayback Machine, Alex Avery and Dennis Avery, Hudson Institute, Center for Global Food Issues, Figure 5, page 22. ^ Coughlin, Chrissy. "Allan Savory: How livestock can protect the land". GreenBiz. Retrieved 5 April 2013. ^ Dagget, Dan. "Convincing Evidence". Man in Nature. Archived from the original on 6 March 2001. Retrieved 5 April 2013. ^ Bradley, Kirsten. "Why Pasture Cropping is such a Big Deal". Milkwood. Retrieved 10 January 2014. ^ Uphoff, Norman (2003). "Higher Yields with Fewer External Inputs? The System of Rice Intensification and Potential Contributions to Agricultural Sustainability". International Journal of Agricultural Sustainability. 1: 38–50. doi:10.3763/ijas.2003.0105. ^ Piras, Nicola. "New record in Bihar thanks to SRI". Agri Cultures Network. Archived from the original on 11 September 2013. Retrieved 20 May 2013. ^ "Use and Status of Rotenone in Organic Growing - Organic Gardening". MOTHER EARTH NEWS. ^ "What makes an organically grown strawberry environmentally friendly?". Tomorrow's Table. ^ Barański, M; Srednicka-Tober, D; Volakakis, N; Seal, C; Sanderson, R; Stewart, GB; Benbrook, C; Biavati, B; Markellou, E; Giotis, C; Gromadzka-Ostrowska, J; Rembiałkowska, E; Skwarło-Sońta, K; Tahvonen, R; Janovská, D; Niggli, U; Nicot, P; Leifert, C (26 June 2014). "Higher antioxidant and lower cadmium concentrations and lower incidence of pesticide residues in organically grown crops: a systematic literature review and meta-analyses". The British Journal of Nutrition. 112 (5): 794–811. doi:10.1017/S0007114514001366. PMC 4141693. PMID 24968103. ^ Smith-Spangler, C; Brandeau, ML; Hunter, GE; Bavinger, JC; Pearson, M; Eschbach, PJ; Sundaram, V; Liu, H; Schirmer, P; Stave, C; Olkin, I; Bravata, DM (4 September 2012). "Are organic foods safer or healthier than conventional alternatives? : a systematic review". Annals of Internal Medicine. 157 (5): 348–366. doi:10.7326/0003-4819-157-5-201209040-00007. PMID 22944875. ^ "Organic food". UK Food Standards Agency. Archived from the original on 5 June 2011. ^ Bourn D, Prescott J (January 2002). "A comparison of the nutritional value, sensory qualities, and food safety of organically and conventionally produced foods". Crit Rev Food Sci Nutr. 42 (1): 1–34. doi:10.1080/10408690290825439. PMID 11833635. ^ Johnston, A. E. (1986). "Soil organic-matter, effects on soils and crops". Soil Use Management. 2 (3): 97–105. doi:10.1111/j.1475-2743.1986.tb00690.x. ^ Hepperly, P. and S. Setboonsarng. "Carbon Sequestration in Organic Agriculture and Climate Change: A Path to a Brighter Future." In Organic Agriculture and Post-2015 Development Goals: Building on the Comparative Advantage of Poor Farmers. Ed. Setboonsarng, S. and A. Markandya. pp 293-322. 2015. Manila: ADB. http://www.adb.org/sites/default/files/publication/161042/organic-agriculture-and-post-2015-development-goals[permanent dead link]. ^ Kirchmann H; Bergström, Lars; Kätterer, Thomas; Mattsson, Lennart; Gesslein, Sven; et al. (2007). "Comparison of Long-Term Organic and Conventional Crop-Livestock Systems on a Previously Nutrient-Depleted Soil in Sweden". Agronomy Journal. 99 (4): 960–972. doi:10.2134/agronj2006.0061. ^ "No Shortcuts in Checking Soil Health". USDA ARS. Retrieved 2 October 2007. ^ a b Hole, D.G. ; Perkins, A.J. ; Wilson, J.D. ; Alexander, I.H. ; Grice, P.V. ; Evans, A.D. (March 2005). "Does organic farming benefit biodiversity?". Biological Conservation. 122 (1): 113–130. doi:10.1016/j.biocon.2004.07.018. ^ a b c "USDSA Guidance Natural Resources and Biodiversity Conservation"(PDF). Agricultural Marketing Service, National Organic Program. United States Department of Agriculture. 15 January 2016. Retrieved 5 March2016. ^ (in French) Institut de recherche de l'agriculture biologique, « 100 arguments en faveur de l’agriculture biologique » Archived 5 March 2016 at the Wayback Machine, second edition, September 2015 (page visited on 8 November 2015). ^ a b c Hole, D.G. ; Perkins, A.J. ; Wilson, J.D. ; Alexander, I.H. ; Grice, P.V. ; Evans, A.D. (2005). "Does organic farming benefit biodiversity?". Biological Conservation. 122 (1): 113–130. doi:10.1016/j.biocon.2004.07.018. ^ a b Gabriel, Doreen; Roschewitz, Indra; Tscharntke, Teja; Thies, Carsten (2006). "Beta Diversity at Different Spatial Scales: Plant Communities in Organic and Conventional Agriculture". Ecological Applications. 16 (5): 2011–21. doi:10.1890/1051-0761(2006)016[2011:BDADSS]2.0.CO;2. PMID 17069391. ^ Bengtsston, J.; Ahnström, J.; Weibull, A. (2005). "The effects of organic agriculture on biodiversity and abundance: a meta-analysis". Journal of Applied Ecology. 42 (2): 261–269. doi:10.1111/j.1365-2664.2005.01005.x. ^ van Elsen, T. (2000). "Species diversity as a task for organic agriculture in Europe". Agriculture, Ecosystems and Environment. 77 (1–2): 101–109. doi:10.1016/S0167-8809(99)00096-1. ^ Perrings, C; et al. (2006). "Biodiversity in Agricultural Landscapes: Saving Natural Capital without Losing Interest". Conservation Biology. 20 (2): 263–264. doi:10.1111/j.1523-1739.2006.00390.x. PMID 16903084. ^ "USDSA Guidance Natural Resources and Biodiversity Conservation" (PDF). Agricultural Marketing Service, National Organic Program. United States Department of Agriculture. 15 January 2016. Retrieved 5 March 2016. ^ Henckel, Laura (20 May 2015). "Organic fields sustain weed metacommunity dynamics in farmland landscapes". Proceedings of the Royal Society B. 282 (1808): 20150002. doi:10.1098/rspb.2015.0002. PMC 4455794. PMID 25994672. ^ a b Shreck, Aimee; Getz, Christy; Feenstra, Gail (21 November 2006). "Social sustainability, farm labor, and organic agriculture: Findings from an exploratory analysis". Agriculture and Human Values. 23 (4): 439–449. doi:10.1007/s10460-006-9016-2. ISSN 0889-048X. ^ a b Getz, Christy; Brown, Sandy; Shreck, Aimee (December 2008). "Class Politics and Agricultural Exceptionalism in California's Organic Agriculture Movement". Politics & Society. 36 (4): 478–507. doi:10.1177/0032329208324709. ISSN 0032-3292. ^ a b Brown, Sandy; Getz, Christy (May 2008). "Privatizing farm worker justice: Regulating labor through voluntary certification and labeling". Geoforum. 39 (3): 1184–1196. doi:10.1016/j.geoforum.2007.01.002. ISSN 0016-7185. ^ "Sikkim to become a completely organic state by 2015". The Hindu. 9 September 2010. Retrieved 29 November 2012. ^ "Sikkim makes an organic shift". Times of India. 7 May 2010. Retrieved 29 November 2012. ^ "Sikkim 'livelihood schools' to promote organic farming" Archived 28 May 2013 at the Wayback Machine. Hindu Business Line. 6 August 2010. Retrieved 29 November 2012. ^ "Sikkim races on organic route". Telegraph India. 12 December 2011. Retrieved 29 November 2012. ^ a b c d Paull, John (2017) "Four New Strategies to Grow the Organic Agriculture Sector", Agrofor International Journal, 2(3):61-70. ^ Martin, K. A. "State to switch fully to organic farming by 2016". Mohanan. ^ "CM: Will Get Total Organic Farming State Tag by 2016". ^ a b "Chiang Mai Citylife - Thailand's Organic Concerns: Understanding the complexities of Organic Farming in Thailand". www.chiangmaicitylife.com. Retrieved 7 June 2018. ^ (www.dw.com), Deutsche Welle. "Fighting Thailand's drought with biodiversity | DW | 28.06.2016". DW.COM. Retrieved 7 June 2018. ^ "CREATIVE CHIANG MAI". www.creativechiangmai.com. Retrieved 7 June 2018. Ableman, M. (April 1993). From the Good Earth: A Celebration of Growing Food Around the World. HNA Books. ISBN 978-0-8109-2517-5. Organic Agriculture: Sustainabiblity, Markets and Policies. OECD. 1 January 2003. ISBN 978-92-64-10150-0. Beecher, N. A.; et al. (2002). "Agroecology of birds in organic and nonorganic farmland" (PDF). Conservation Biology. 16 (6): 1621–30. doi:10.1046/j.1523-1739.2002.01228.x. Brown, R. W. (1999b). "Margin/field interfaces and small mammals". Aspects of Applied Biology. 54: 203–210. Emsley, J. (April 2001). "Going one better than nature". Nature. 410 (6829): 633–634. doi:10.1038/35070632. Gabriel, D.; Tscharntke, T. (2007). "Insect pollinated plants benefit from organic farming" (PDF). Agriculture, Ecosystems and Environment. 118 (1–4): 43–48. doi:10.1016/j.agee.2006.04.005. Kuepper, G. and L. Gegner. Organic Crop Production Overview., ATTRA — National Sustainable Agriculture Information Service. August 2004. Paull, J. (2006). "The farm as organism: The foundational idea of organic agriculture". Journal of Bio-Dynamics Tasmania. 83: 14–18. Markandya, A. and S. Setboonsarng. 2008. Organic Crops or Energy Crops? Options for Rural Development in Cambodia and the Lao People's Democratic Republic. ADB Institute Research Policy Brief 29. ADBI, Tokyo. Smil, V. (2001). Enriching the Earth: Fritz Haber, Carl Bosch, and the Transformation of World Food. MIT Press. ISBN 978-0-262-19449-5. Wheeler, S. A. (2008). "What influences agricultural professionals' views towards organic agriculture?". Ecological Economics. 65: 145–154. doi:10.1016/j.ecolecon.2007.05.014. Wickramasinghe, L. P.; et al. (2003). "Bat activity and species richness on organic and conventional farms: impact of agricultural intensification" (PDF). Journal of Applied Ecology. 40 (6): 984–93. doi:10.1111/j.1365-2664.2003.00856.x. Wikimedia Commons has media related to Organic farming. Organic Eprints. A database of research in organic food and farming. Organic Agriculture. eOrganic Community of Practice with eXtension: America's Land Grant University System and Partners. This page was last edited on 17 March 2019, at 19:40 (UTC).